This is a great recipe, but I changed a few things and have a few tips to make your apples incredible! First, you need a sweet and CRISP apple to get a good result here. I used Honey Crisp apples and got compliments at the Halloween Potluck I took these to about how good the apples were. I used 2 bags of cinnamon disks, double the water and 1 tablespoon of cinnamon extract as my cinnamon disks didn't seem to be quite fiery enough; not like red hots at least. I found that it takes some time to melt this down and before you get there they all combine into a huge piece of hard candy. It was at this point I got nervous, but just keep stirring and eventually you will have everything melted. I used a candy thermometer after all was melted and turned up the heat to reach 300 degrees. When you reach the 300 degrees, it will be a bubbling couldron of candy and will have expanded a bit. Turn off the stove at this time and start your dipping. You will get a gorgeous glossy candy coating that when set will be hard. With the 2 bags this yielded 7 large apples. 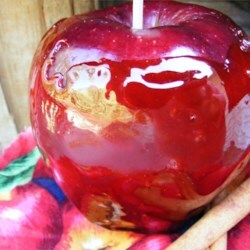 This will be my go to recipe for candy apples!